JM International invites you to the 2017 edition of the JM Jazz World Orchestra! Join this inspiring musical and intercultural experience where musicians can look forward to one week of fun together with top young international jazz musicians before touring and performing at some of Europe's most renowned jazz gigs. We are looking for highly talented musicians between the ages of 18 and 26 playing saxophone, trombone, trumpet, horn, tuba, guitar, bass, drums, percussion, piano and vocals. It is essential that you read music sheets, but the most important thing is your love for jazz music! We are excited to announce that Luis Bonilla (USA) will join us one last time to lead this year's JM Jazz World. Bonilla, a California raised, Costa Rican trombonist, composer and arranger, has taken in and mastered an incredible array of musical styles. His success as a sideman with such greats as McCoy Tyner, Dizzy Gillespie, Lester Bowie, Tom Harrell, Freddie Hubbard, Astrud Gilberto, Willie Colon and Toshiko Akiyoshi attests not only to the skill and variety of Bonilla’s talent, but also to a mind restlessly committed to exploring some of the most complex and demanding music of our time. The Rehearsal Session will take place at the beginning of July in Groznjan, Croatia, and will continue with a tour until mid July. Applicants will have the chance to socialize, play and work together to create the best young big band the world has ever seen. Fill out the online application form by Sunday, March 12th 2017. 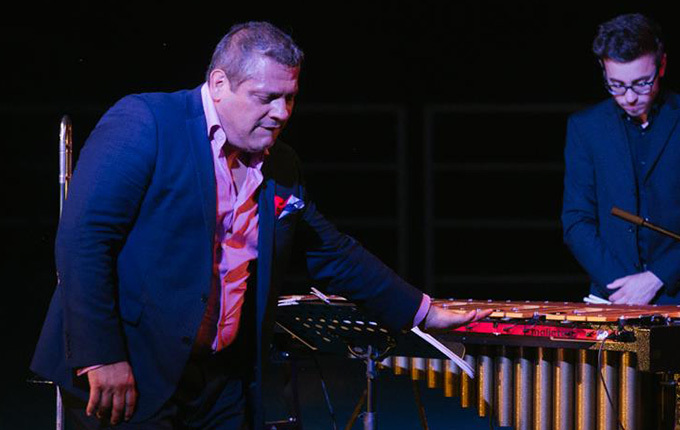 Get a taste of what it is like to perform with the Orchestra and Luis Bonilla! Interested in some of these? All the best content in your inbox. We promise not to spam you.